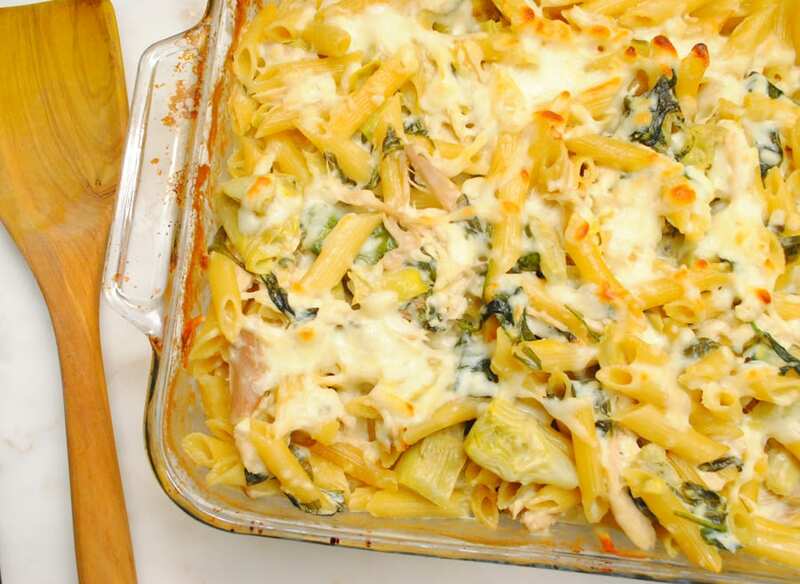 This classic flavor combination of artichokes and spinach bakes in the oven with penne noodles and rotisserie chicken. Top it with gooey cheesey goodness and dinner is served. This No Boil Spinach Artichoke Penne is the perfect weeknight meal. It cooks up with minimal fuss right in the oven. No pre boiling noodles here! Just combine everything with some chicken stock and the noodles cook in the oven. Recently I had dinner at a friends house where she cooked Pinch of Yum‘s No Boil Baked Penne with Meatballs. I was amazed at how she was able to cook the penne in the oven with out pre boiling it. Granted it takes longer to bake, but there are no added pans, no boiling water, and hands free cooking. I loved the recipe and the concept and knew I wanted to try a recipe of my own. Rotisserie chicken is my protein of choice for this delicious meal. You can certainly leave it out for a vegetarian version and use vegetable stock instead of the chicken broth. The possibilities are endless. 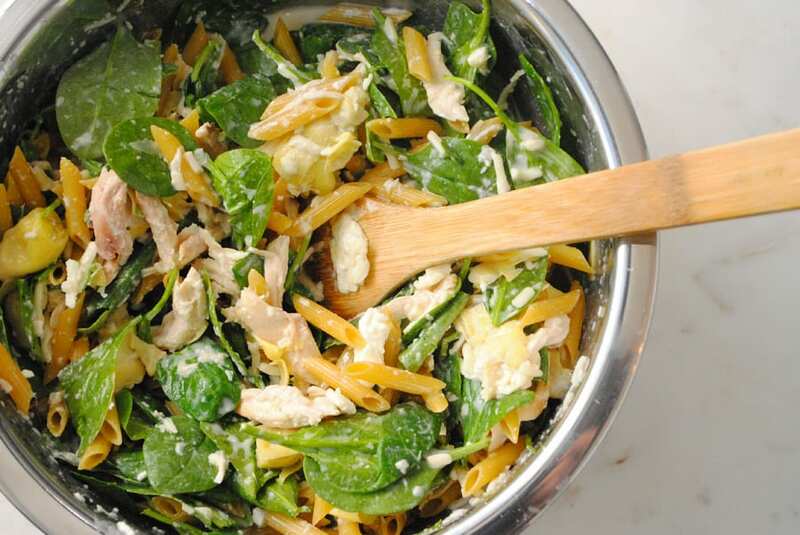 I love spinach and artichoke dip and the flavors of that truly shine in this No Boil Spinach and Artichoke Penne dish. It’s cheesy, briny, salty, and most of all delicious. You can preassemble this too. Just combine all of the ingredients minus the stock and store it in the fridge. Pour the stock over the entire casserole dish before you bake it cover it tightly with aluminum foil and bake. Dinner is served! Use your spare hands off time to help your kiddos with homework, fit in a quick work out, or let your dog out. 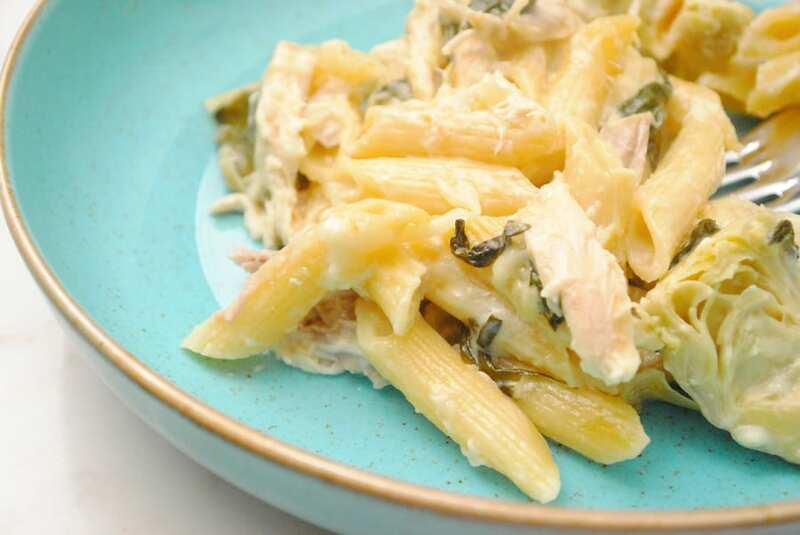 Enjoy this No Boil Spinach and Artichoke Penne. No pre boiling noodles here! Everything bakes together in the oven for a delicious, hands off meal. 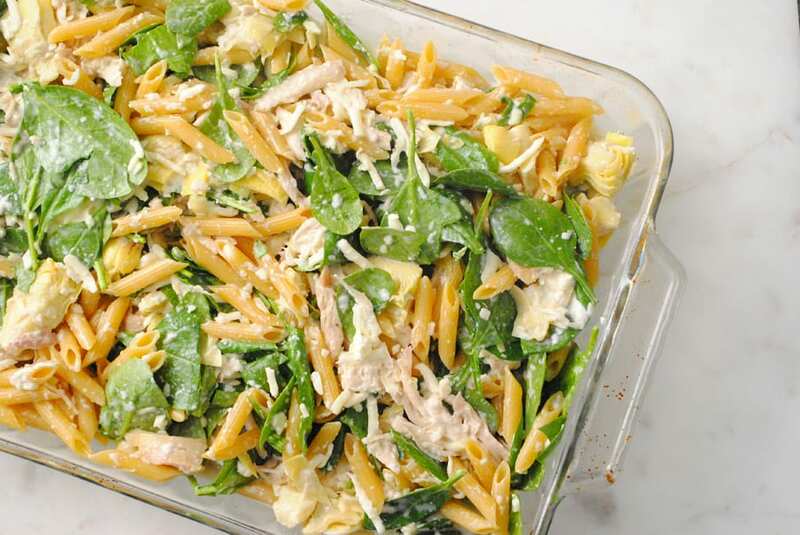 In a large bowl combine the penne, cream cheese, chicken stock, 1 1/2 c mozzarella cheese, parmesan cheese, artichoke hearts, spinach leaves, rotisserie chicken, salt and garlic powder. Stir well to combine and put into a 13″ x 9″ casserole dish. Cover tightly with aluminum foil and bake for 50 minutes. Stirring halfway through. Uncover, sprinkle with the remaining 1/2 C mozzarella cheese and continue to bake uncovered for 10 more minutes. Can you use GF penne? I haven’t tried it with gluten free but I imagine it would work fine. If you try it will you let me know? Thanks for the comment Alison.